Photo by Steve took it. My life often seems to be forward march, reverse, back and forth, time-speeds-by and then-time-crawls. This summer has been such a one- I’ve been careening toward a future and yet resolutely stuck in a past that won’t let go of me quite yet. It’s an odd feeling. Today I glance over a new school year, with new decisions made, new books, new bags, new everywhere. My sister is newly a wife…I spent the weekend at her wedding, doting on her as all matrons of honor do. It was a lovely time, and yet there was silver mist about the edges…some things will ever be painful for me, and weddings are such an occasion. I had to fly- our current work situations would not allow much more- and I spent much of what should have been a calm and joyful weekend caught in the vortex of our archaic air transportation system. What was supposed to be quicker, easier, faster, calmer- all opposite. I’ve never been one to have panic attacks, but I came awfully close yesterday. It is not something I wish to re-live any time soon. I want to talk about the lessons I’ve learned over the last six months- they are too valuable not to share- but recent events have left me feeling shockingly, panic-filled vulnerable again, and I don’t know what that means for this blog. I’ve always spilled heart-words here, driven to dash my scribbles across the digital page…but I’ve felt so driven to quiet (for many reasons, online and off) that I begin to wonder what is in store for my little place here. If there is anything I’ve learned over the last few years, it is that we cannot run from our troubles, our time-crawls, our time-evaporations…we must ever be in the moment- in and around and through- so there it is that I am today. One foot in front of the other, thoughtfully, prayerfully. spill as you can; write the true for you. I understand what you mean about being driven to quiet. I hope that as you find that quiet, words pour forth from that deep still spring. I love reading your blog. I will remember you this week. One of the greatest gifts of blogging is that sometimes, because of something you share, people pray. i can not grasp the moving-in-time thing. 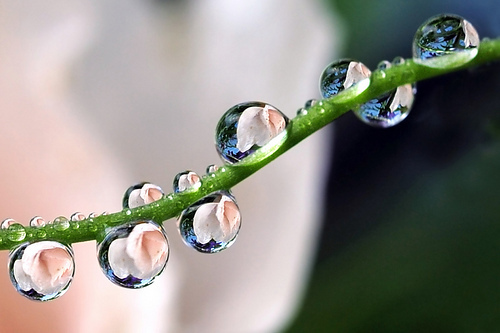 the photo is a very pretty line of pink drops.